This panorama is the view NASA’s Mars Exploration Rover Opportunity gained from the top of the “Cape Tribulation” segment of the rim of Endeavour Crater. Image Credit: NASA/JPL-Caltech/Cornell Univ./Arizona State Univ. NASA’s Mars rover Opportunity might never be classified as speedy, averaging only slightly more than 2 miles (3.36 kilometers) per year since its landing on Jan. 25, 2004, at 05:05 UTC. Nevertheless, what the stalwart explorer lacks in range is more than made up with its longevity. Opportunity—also known as Mars Exploration Rover – B (MER-B)—has been in active operation on the Red Planet for 13 years, far exceeding the original planned mission of 90 sols (approximately 92 Earth days, with each sol being a full Martian day, lasting 24 hours, 39 minutes, and 35 seconds). Opportunity, like its now-silent twin Spirit, was designed to study geological and mineralogical features on Mars, with a goal of determining if the Red Planet might have ever had water on its surface. With water being a key ingredient for life as we understand it, scientists were keen to know if conditions on Mars might have ever been conducive to the development of life; therefore, the telltale signs of hydrologic activity was the primary mission for both rovers. Opportunity was launched atop a then-Boeing Delta II Heavy—the first payload to fly on that variant of the Delta II—from Space Launch Complex 17 (SLC-17) at Cape Canaveral Air Force Station on July 7, 2003. Once lofted into space, the robotic rover was sent on its journey to land on Meridiani Planum—a large, flat plain just south of Mars’ equator. After a six-and-a-half month cruise, Opportunity survived the high-speed—approximately 3.5 miles per second (5.6 kilometers per second)—entry into Mars’ atmosphere and bounced to a landing inside a small crater in Meridiani Planum, well within the targeted 93 by 12.5 miles (150 km × 20 km) ellipse, on January 25, 2004. Only six weeks following its landing, Opportunity made its first discovery that hinted to a wetter environment in Mars’ past. While exploring a rock outcrop, which was dubbed “Guadalupe“, the rover’s microscopic imager showed the presence of sulfates which, on Earth, usually form in a watery environment. A few days later, Spirit would make a similar discovery, further strengthening the theory that Mars once may have had rivers, lakes, or seas on its surface. Over the coming weeks, Opportunity would continue to find evidence supporting Mars’ wet past. Though the rover was primarily designed to search for signs of water, the robotic explorer made its share of findings not related to the main mission. 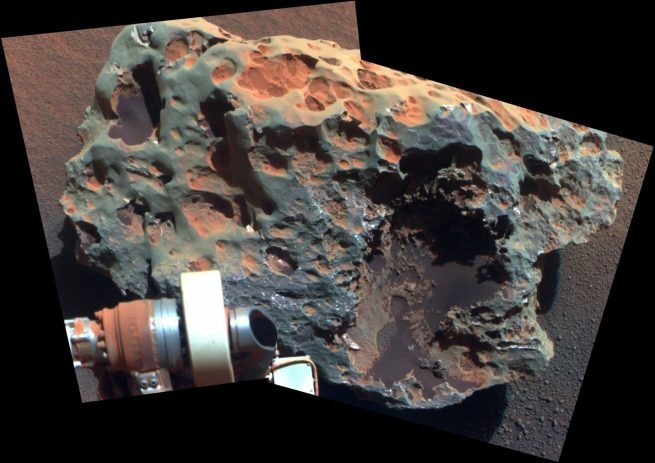 Both Spirit and Opportunity have found several meteorites, just sitting on the planet’s barren plains, with Opportunity studying the particularly noteworthy “Block Island” rock in 2009. Block Island, an iron-nickel meteorite, is the largest meteorite to be discovered on Mars and is estimated to weigh at least half a ton. Scientists are certain that a rock of its mass could not have survived an impact with the Martian surface unless Mars’ atmosphere used to be significantly thicker and slowed the meteorite’s entry more than today’s thin atmosphere could. Not content to only study Mars, the rover turned its panoramic camera (Pancam) skyward in 2014 to image comet C/2013 A1 Siding Spring as it passed near the Red Planet. No mention of Opportunity’s achievements would be complete without mentioning how far the rover has traveled. Though initially designed to last for 90 sols and travel a scant 1,970 feet (600 meters), Opportunity has shattered both targets by a significant margin. The rover has not only marked 13 years of surface operations but also has trundled 27.21 miles (43.79 kilometers) across Mars as it continues to gather data for scientists. Both are records for rover surface operations. However, Opportunity hasn’t survived unscathed. Within a year of landing, the motor powering one of Opportunity’s wheels had to be disengaged after it ceased to function. However, the vehicle was engineered so that it could still operate in this condition and progress could continue. Not too long thereafter, the rover became stuck in a sand dune when it was instructed to drive on its own rather than relying on its Earth-bound handlers to painstakingly calculate a path and upload it to the rover. It took engineers approximately one month to free the rover so that it could resume its extended mission. The rover also seemed to develop a touch of “robotic arthritis” with one of the motors in the shoulder joint of the arm holding many of the rover’s instruments. The motor continues to operate, though it requires more power to do so. Perhaps most troubling, though, was the “amnesia” suffered by the rover. After Opportunity had suffered an increasing frequency of computer resets, engineers decided to reformat the rover’s memory. 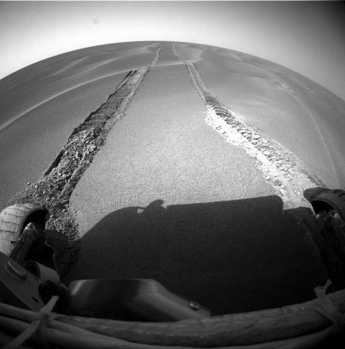 Just as with home computers, the data storage on Opportunity degrades over time, and the format allowed the rover’s computer to identify the bad areas of memory and mark it as unusable. Luckily, mission-critical data is stored in more secure memory and wasn’t in danger of being corrupted during these resets. Though Spirit is silent, Opportunity continues to operate and provide scientists with valuable data. As such, the rover’s mission has been extended yet again and is funded through 2018. Opportunity is currently tasked with studying a gully in the “Bitterroot Valley” portion of Endeavour Crater. Meanwhile NASA is continuing to build on the robotic geologists’ (including Spirit and the Mars Science Laboratory rover Curiosity) legacy. At present, the U.S. space agency is working on its Mars 2020 rover. As the name implies, the mission is currently planned to launch in three years’ time.